Communist Chinese use kamikaze tactics against the American fleet off Formosa in this seven-page story entitled "The Red Kamikaze Terror." The Blackhawks, an independent paramilitary squadron of six pilots of diverse nationalities, use their fists and advanced fighters to stop a plot by the Communists to use Formosan Nationalist planes to dive into American warships. The comic Blackhawk, named for the squadron leader, dates back to 1941. During the 1940s, the Blackhawks fought the Axis powers, but the Reds (Communists) became their foes in the 1950s. 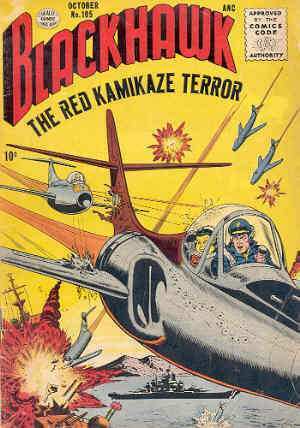 "The Red Kamikaze Terror" depicts typical Allied and Japanese wartime attitudes toward kamikaze attacks, but the Chinese Communists instead of the Japanese are the ones advocating the use of kamikaze tactics in this 1956 story. The story opens in the middle of a dogfight in which the Blackhawks stop Red dive bombers from an attack on American ships of the Seventh Fleet off Formosa. The Formosan Intelligence Chief, really a Communist secret agent, lures the Blackhawks to an airfield where the Reds have taken Nationalist pilots hostage. They detain the Blackhawks when they land, and the Red pilots take off in stolen Formosan jets to make suicide attacks on the American fleet. The mastermind of this plot thinks that the Americans will believe that the pilots made these suicide attacks as an act of contempt and defection against Nationalist China since the Communist pilots in the Formosan Air Force planes will be blown up as part of the attack. The Blackhawks fight with their fists, not guns, to escape their captors and go after the Red pilots. Although outnumbered three to one, the Blackhawk pilots destroy the Reds even though some try suicidal ramming attacks on the Blackhawk planes. The comic book's front cover shows a Red plane hitting an American ship, but this never happens in the story. The Communist secret agent describes the Red kamikaze pilots as "noble," "courageous," and "true heroes." Japanese propaganda used similar descriptions for kamikaze pilots who made suicide attacks near the end of World War II. Blackhawk expresses a contrary belief, "But unlike your Red kamikazes who can only die for their cause, we'll live for ours." He describes their actions as being "like the Jap suicide dives during World War II," but he makes clear his opinion when he refers to the pilots as "kamikaze nitwits." Although he uses this phrase, the real villains in this story, as many other Blackhawk stories published in the 1950s, are the "power-crazed Commies."